Blake and Tracy Eliasson, owners of Settembre Cellars in Boulder, met at a wine bar while they were in college - and they weren&apos;t even there for the wine. Trilogy Wine Bar was also a Boulder music venue, and the two went with friends to hear bluegrass. In hindsight, Tracy realizes that the location of their meeting may have been a sign: It wasn&apos;t too long after they married that Blake took up wine-making at home as a hobby. 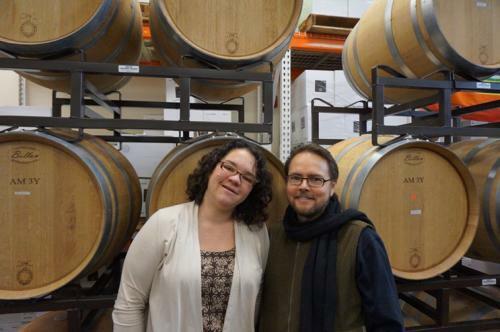 And a few years after that, the couple opened Settembre Cellars, the north Boulder winery where they produce a portfolio of wines from five Colorado-grown varietals. Blake was working on his Ph.D. in electrical engineering when his appreciation of good wine turned into curiosity about how to make it. "I approached it with a Ph.D. mentality - reading everything I could," he explains. "Eventually, I decided I had to take a whack at it." "Blake is definitely a book guy," Tracy adds. "When we were dating, I asked him if he was ever in Boy Scouts and he said, ‘No, but I read the manual.&apos;"
He purchased wine kits that were basically concentrated grape juice and also bought a stainless-steel fermenting vat because he didn&apos;t like the idea of using plastic vessels. Still, the wines he made weren&apos;t what Blake was hoping for; from his reading, he knew that using whole grapes was the only way to achieve a better result. With the kits, the important aspects of the wine-making process - harvest, press, pasteurization, sugar and acidity levels - were all controlled by someone else. "It&apos;s such a different process," he notes. "I was never satisfied with the stylistic control; I wanted to control the nuances and balance."